Those Japanese games had these dense and mysterious soundscapes... A song would just loop the whole time you were in an elf village or whatever. It was catchy and mysterious — that sounds like good music to me. Final Fantasy. 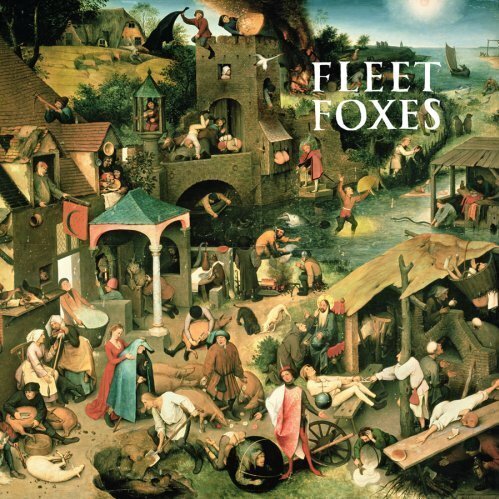 Fleet Foxes. It’s at least alliterative. That’s always a good start. Again, as with the relationship between Creaky Boards and Legend of Zelda, the influence isn’t as pronounced as you might expect, but, in the end, that’s a good thing. In general, the songs don’t work in a way that you might end up humming them, but they’re lush and evocative of something grand and sweeping. It’s hard to use the term “soundscape” without sounding a little pretentious, but then again it’s hard not to sound pretentious while raving about how a childhood favorite has resurfaced in a cool new band. The songs also could serve well as background music to something else — not unlike what you might hear in Final Fantasy. For those of you for whom Final Fantasy wasn’t part of your formative years, this all means nothing. You still might like Fleet Foxes anyway, provided similarities to the aforementioned bands and Crosby, Stills, Nash & Young aren’t a turn-off. For those of you with even a basic knowledge of Black and White Mages, I urge you to check the band out, especially the tracks “Quiet Houses” and “Ragged Wood,” which reminded me most of those looping old melodies. The only Fleet Foxes track I could find attach to a YouTube video was “White Winter Hymnal,” which is also good. Enjoy! EDIT: Since this went up and since Fleet Foxes sort of blew up in terms of popularity, YouTube clips for “Quiet Houses” and “Ragged Wood” have made it online. Having seen no mention of it, I take it you are unfamiliar with the music of Owen Pallett, aka. "Final Fantasy"? Ah. Now that you mention it, I do know of him. But I've never actually heard his work. Does the sound reflect the namesake?